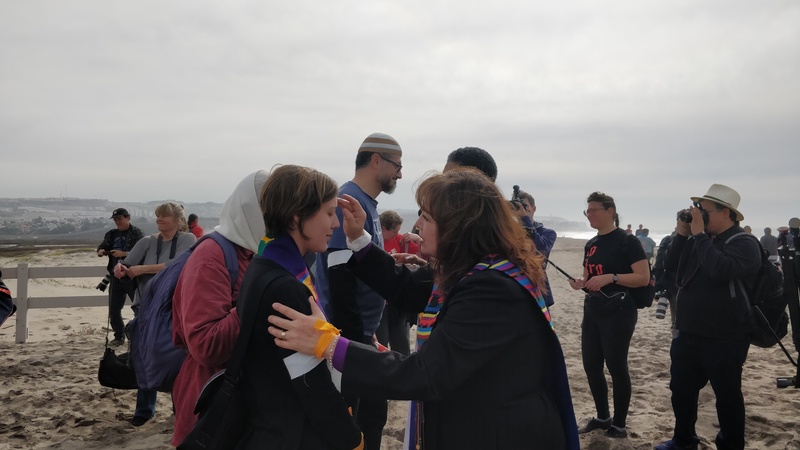 On December 10, nearly 500 clergy and supporters converged on the southern border of the U.S. at Border State Park in San Ysidro, Ca. 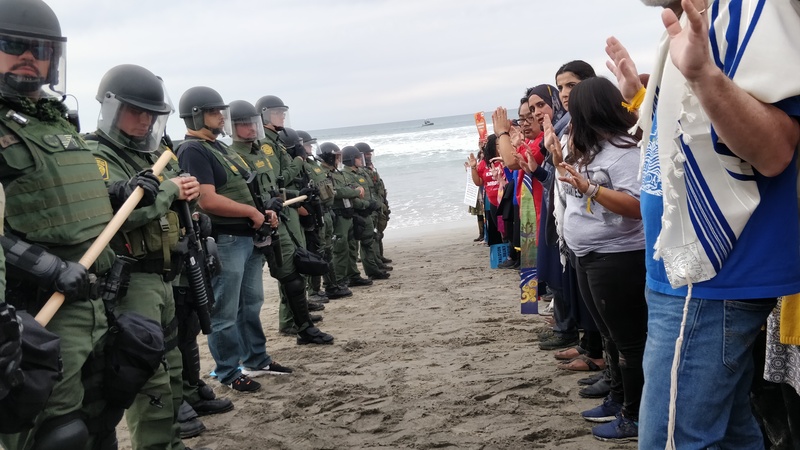 Organizers from the American Friends Service Committee and the Poor People’s Campaign had called for a nonviolent direct action at the beach area of the U.S. border with Mexico, an area that had recently seen new installations of razor wire and blockades. Many of the organizers had traveled hundreds of miles to participate in the direct action, and nearly every religious tendency was represented in the procession to the wall. There had been recent rain in San Diego, and as a result the march through the Tijuana River Valley was marked with mud and narrowed trails. 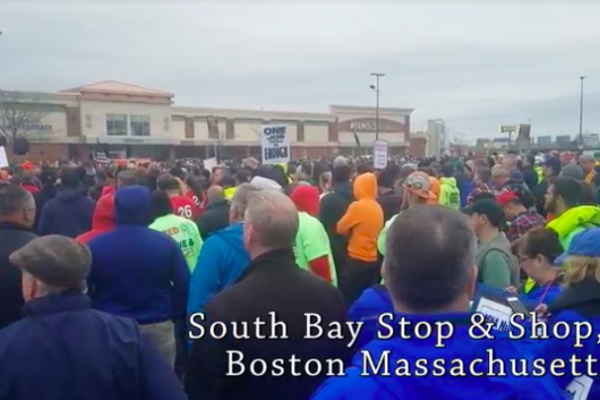 Despite the conditions, organizers were able to lead the march onto the beach that takes people to the border wall. The organizers were disciplined, with volunteers willing to be arrested marked with white arm bands. Roughly one hundred volunteers, mostly clergy, made up the front of the march down the beach in a column four wide. 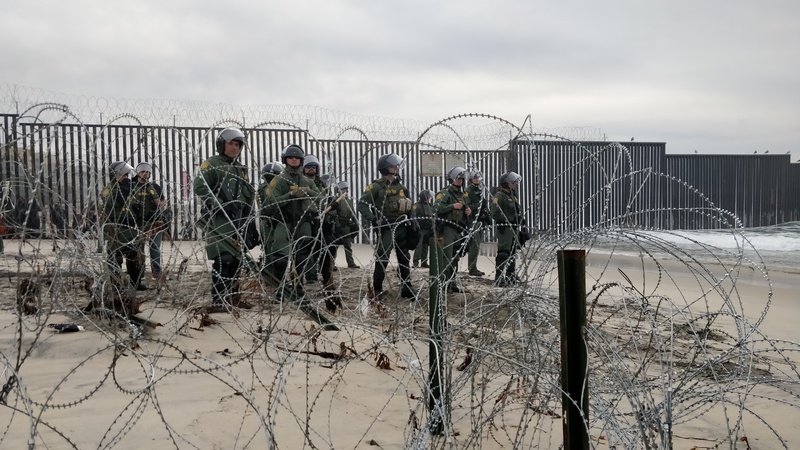 Waiting to meet them stood over a dozen fully armored federal agents, flanked by barricades of razor wire and supported by dozens of agents in reserve on the hilltop above. 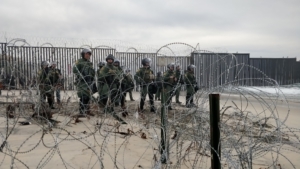 A brief stalemate ensued as federal agents with Homeland Security and Border Patrol sought to prevent organizers from entering a recently reinforced zone in front of the border wall. 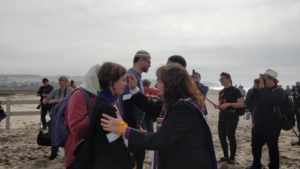 Organizers linked arms, many of them wearing their religious vestments, and approached the zone despite repeated threats of force by the police. Eventually federal agents made limited arrests, with a couple of arrestees being quickly spotted afterwards. Liberation News spoke with a young woman who had been detained by the federal agents and she proudly displayed an X drawn on her hand, saying that she had been “given a verbal warning and marked in case of further arrest.” Clergy members were pushed and threatened by federal agents, as other religious leaders knelt in the sand or ocean and prayed. 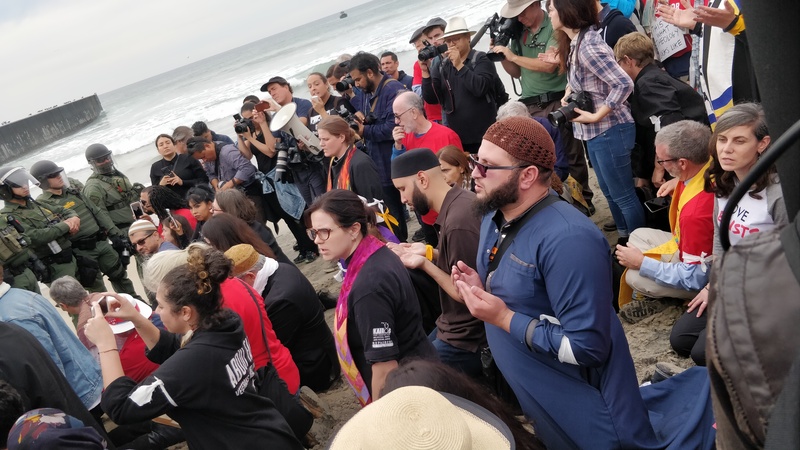 Thirty two organizers and clergy members were taken into custody in this act of civil disobedience before organizers called for people to return to the staging area. 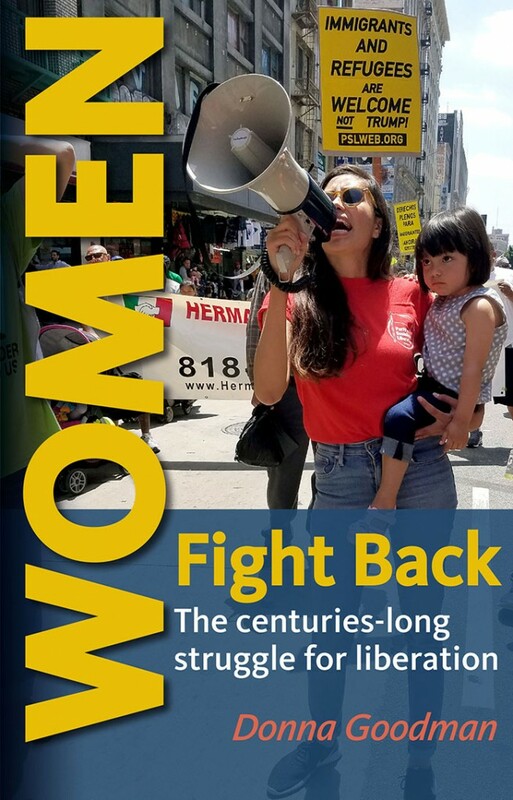 The march and acts of civil disobedience once again laid bare the violence used by the U.S. state at the border, both against refugees seeking asylum in Tijuana and people participating in nonviolent protests in the U.S.. 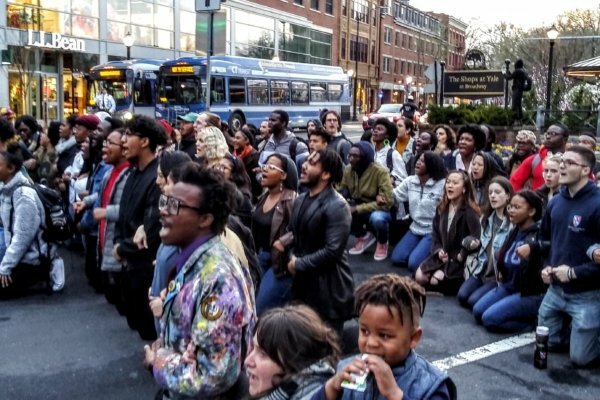 Under the auspices of “protecting federal property” and being authorized to use violence to preserve the “law,” federal agents exposed themselves for what they are: paid agents of a system seeking to reinforce the exploitative status quo at the expense of all of us. 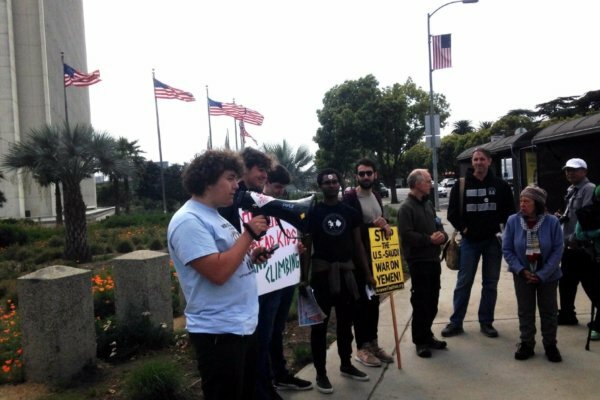 Organizers in San Diego and elsewhere have pledged to continue organizing actions in support of the caravanistas and for an end to the imperialist wars and coups that have created the conditions for such a widespread humanitarian crisis.